Acupuncture is the process of putting thin long needles in the different pressure points of our body. Each organ or each part of our body corresponds with a pressure point. These pressure points are not in the same area as where the body part is found. What I mean, as an example is: if the problem is a saw back the corresponding pressure point might be found in your hand and not in the back area. By putting a needle in these pressure points. They are literally trying to stimulate the blood flow in that part of the body. The blood circulating more and better is supposed to fix the underlying problem. In the above example it would be the backache. They also use other methods to stimulate the blood flow. They might use heat pads, massage, electro magnetic pulses (used when patient is scared of needles, but not as efficient as needles) or suction cups. Suction cups is when they literally make a series of minute cuts with a blade. These cuts are then covered with a plastic cup. They take out the air from the cup and a suction is formed. Thus doing, the cup fills up with blood and sometimes with thick substances of rubbish. By removing this bad stuff. Blood flow will increase and healing takes place taking away the pain. This practice is not done by many acupuncturists. 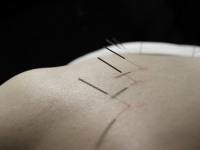 Acupuncture dates back to ancient Chinese civilization, and has been performed for thousands of years. It has become very well known and popular in the Western world in the last 20 years. It has also become recognized by many Western medical professionals as a good therapy that works. Used for all types of ailments, from a headache to a toe ache. I would recommend this therapy as being an excellent alternative to some western methods. The important thing is to find the right acupuncturist, as there are many that don't know what they are doing. Usually they are Chinese. The other thing to look out for is cleanliness and method of procedure. In other words they should be using a new sterile needle out of the packet for each pressure point. In general the place should look professional and clean. I personally tried accupuncture for my hemorrhoids. I had an excellent Chinese accupuncturist. He did the needles and also did the suction cups (very saw) on me. It most definitely got rid of my hemorrhoids. Unfortunately the hemorrhoids soon returned. I went several times, and each time the hemorrhoids disappeared, but very soon reappeared. With the knowledge that I know now. I know that the hemorrhoids were returning because of my bad toilet procedures.